The fundamental goals of this project are increasing the diversity of students studying environmental science and training the next generation of global scientists. In the current global extinction crisis, islands are especially vulnerable, and most endangered and extinct avian species are—or were—island species. Island species in the Caribbean may be especially vulnerable to climate change and sea level rise. UMBC's strength in promoting inclusive excellence in STEM provides the opportunity to broaden student participation and make an impact in international research. Students will conduct their research in a region and in a country dramatically threatened by climate change. Your support will enable students to conduct international research in the Bahamas. These projects will enable students to develop deep understanding of a range of topics in environmental science related to island ecosystems, extinction and climate change. Island ecosystems have always been vulnerable to human impacts, and many island species are endangered or have become extinct. The Caribbean is home to fifteen endangered songbird species, including the critically endangered Bahama Oriole ( Icterus northropi ). 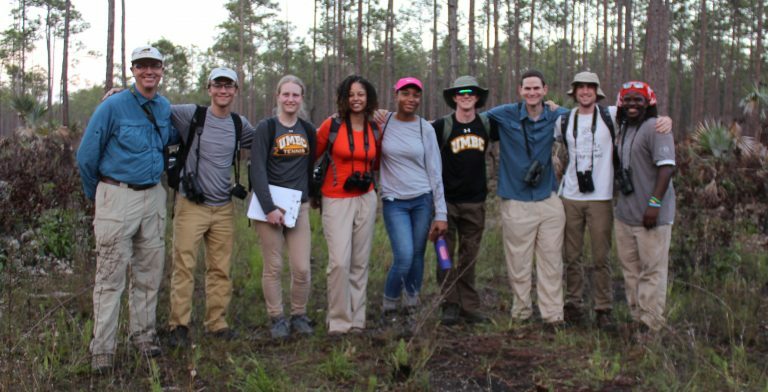 The student research experience is part of a collaboration between UMBC and The Bahamas National Trust to determine the status of the Bahama Oriole and to understand how habitat and climate change may affect it. Students will work on the research team led by UMBC faculty member Kevin Omland. Dr. Omland has been at UMBC since 2000 and has been named UMBC Presidential Research Professor for 2016-2019. He has been researching the ecology, evolution and behavior of the oriole genus for the past 20 years, which has resulted in more than 40 publications, including many with student authors. 2017 Research Team (L to R): Kevin Omland, Michael Rowley '18, Jen Christhilf '18, Cierra McKoy '20, Briana Yancey '19, Matt Kane '19, Rick Stanley (MS student, Imperial College London), Daniel Stonko (UMBC graduate 2017), Scott Johnson (Bahamas National Trust). The proposed student research experience will train students in a range of skills to help build future career success. Your support today, will continue to make this research possible. Thank you.